Seen today from the same location you can see two tracks of very much heavier rail. The ‘down hill’ track on the right is, not unsurprisingly, well warn. Evidence of the tremendous braking action needed to maintain control of today’s long, heavy trains as they make their way into Revelstoke 750 feet below. 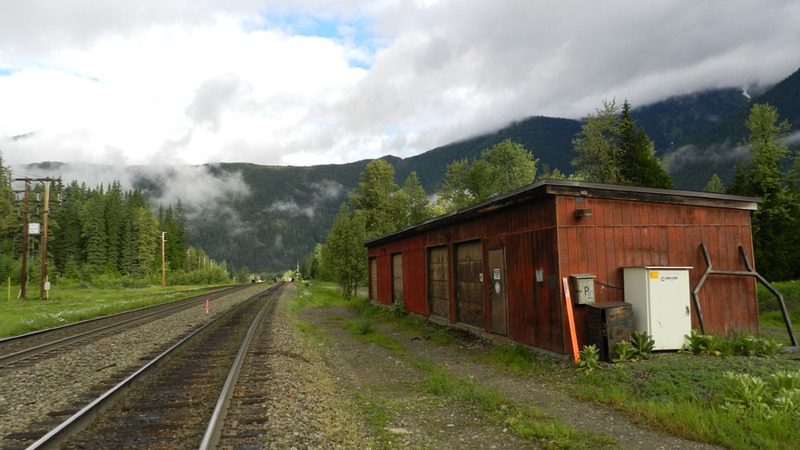 The tool and speeder shed sits on the same location as the old station. Nothing remains to suggest that the water tower was ever there, next to the small mountain stream that feeds the Illecillewaet River. The same lag of the Y is visible here as in the first photo taken 100 years before. So it’s not a simple shed commonly seen trackside. I expect as a result of the some special needs related to the location there are six doors. The heavy snowfall in Albert Canyon would surely cause some unique problems. Someone might know what that angular piece of steal leaning up against the end of the building is used for. It certainly looks very businesslike.